The prophet Yeshayahu's vivid and terrifying visions of destruction, and his magnificent words of comfort, have accompanied the Jews throughout their long and difficult exile. Destruction and rebuilding, mourning and consolation: these are the immortal themes of Sefer Yeshayahu, the book of Isaiah. Small wonder, then, that Rabbi Shimon Schwab zt"l, the much beloved Rav of K'hal Adas Yeshurun and one of the foremost Torah scholars of his day, was able to delve so deeply into the prophet's timeless words. As a refugee who barely escaped the fires of the Holocaust that decimated his Kehillah of Frankfurt-am-Main, and all of Eastern European Jewry, he experienced the destruction of one world; as the bearer of both the German-Jewish and the Lithuanian Yeshiva traditions, helping to rebuild both on new shores, he experienced at least a modicum of comfort. In his unforgettable lectures on Sefer Yeshayahu to his congregation, Rav Schwab revealed the profound wisdom and beauty of the prophecies. 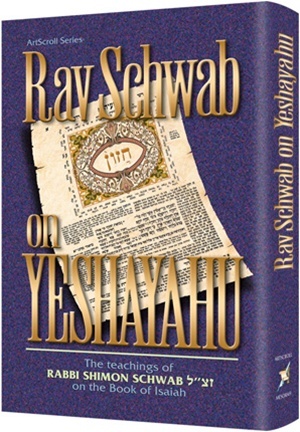 In this important work, Rav Schwab's eldest son, Rabbi Moshe Schwab, has adapted these lectures, making them accessible to all. 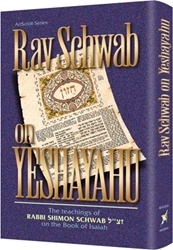 In Rav Schwab's verse-by-verse explanations of the history of the time, Yeshayahu's demands for social justice and repentance, his stern admonitions and his loving words of comfort grow clear to us, resonating in our own lives and concerns. In this commentary we see Rav Schwab's brilliance, his deep understanding of Torah tradition, and his warm humanity, as he gives us a new insight into the immortal prophecies of Yeshayahu.